Sonthi Limthongkul, the media firebrand who led the street protests against former Prime Minister Thaksin Shinawatra, was sentenced to two years in jail on Thursday. Sonthi was convicted of committing libel against Phumtham Vejjayachai, the deputy secretary of Thaksin's Thai Rak Thai party. 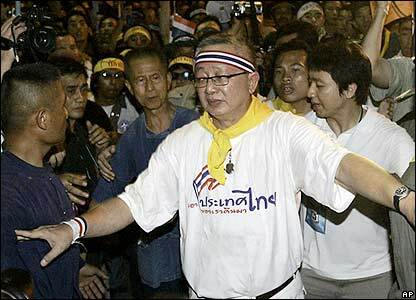 During a speech at a Buddhist temple last year, Sondhi accused Phumtham of having disrespected Thailand's monarchy by joining a communist insurgency during the 1970s. Phumtham said Sonthi had gone too far in apersonal attack that breached Thai etiquette by dragging the monarchy into political disputes. He also said that many prominent figures who were students in the 1970s had joined the revolutionary struggle against the military dictatorship of the time. Sonthi said he plans to appeal the case.